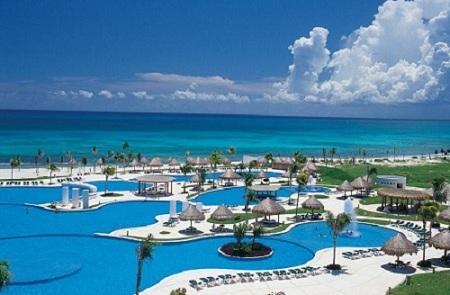 The Bliss Riviera Maya in Cancun, Mexico - Bid on a 7 Night Stay in a Master Room! The Bliss captures the essence of vacationing in style. Tucked away on a breathtaking 338 acre property, The Bliss Riviera Maya is surrounded by jungle and mangroves. With a total of 21 buildings, your stay will be both private and adventurous. A trip to The Bliss Riviera Maya is an eco-journey in the tropical forest, lagoons, water canals and coastal dunes with all the hospitality and charm of Mexico from a by-gone era, the Mayan era. The Bliss conveys a feeling of being home, with a Mexican flare. Each room is designed with space and convenience, albeit traveling with your family or on a romantic getaway. Like all our Resorts, The Bliss is designed with your family in mind. A place to create memories, try new activities, taste the Mexican flavors and soak up fun under the sun. Located at the exclusive Riviera Maya just 15 min. away from Playa del Carmen. Take a ferry to Cozumel. Enjoy the white sand beach, the beautiful blue Caribbean water and practice your favorite water sport. Enjoy the fascinating meals prepared by international chefs at our beautiful restaurants. Participate in the daily activities program to enhance your vacation. Play at our beautiful golf course designed by Jack Nicklaus. Try our top-of-the-line gym, spa and magnificent swimming pools. MASTER ROOM: The master rooms are located throughout the resort so every view is equally as beautiful. Open the door to the Master Room and open your eyes unto the foliage of the jungle. Each room offers a quaint balcony that welcomes daily sunsets. The king size bed boasts direct views outside and is quipped with ample bathroom space. Pet Information: Pets are not accepted; could result in forfeiture of the unit and/or other penalties. Extra fee for parking, internet, gym, tennis and golf. Due to Coral reef, beach is best suitable for snorkeling.Must enter with care.